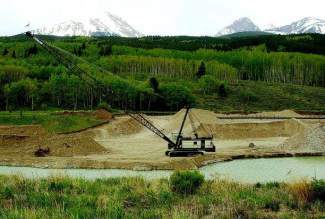 A crane moves sand and dirt in this photo from before the South Maryland Creek Ranch was annexed by the town of Silverthorne. Property owner Tom Everist runs a gravel mining operation on the northern part of Maryland Creek Ranch and will develop a residential subdivision on the southern 416 acres. A look at how the South Maryland Creek Ranch development has changed over the last 15 years. After a couple months of opposition to a development in Silverthorne, just one person spoke against the proposal Wednesday, June 10, before the Silverthorne Town Council approved the property’s density change. The vote was 4-1 with Mayor Pro-Tem Ann-Marie Sandquist and council members Russ Camp, Derrick Fowler and Peggy Long in support of South Maryland Creek Ranch’s change from 83 to 240 units and Stuart Richardson the lone dissenting voice. Mayor Bruce Butler only votes to break a split decision, per town charter, and Councilwoman JoAnne Nadalin had not been sworn in in time to vote on the change on second reading. Tom Everist, a longtime resident and the property’s developer and owner, said he was pleased with the council’s approval and overall process. In March, the council postponed its vote on the density change for 60 days to allow Everist and his team to meet with community members. Residents’ outcry centered around sprawl down the Lower Blue River Valley and growth that would change the area’s rural character as well as concerns around traffic and wildlife threats. No one attended the June 10 meeting from the conservation organization Friends of the Lower Blue River (FOLBR), which started a petition that garnered roughly 300 signatures against the development’s change, said Marty Richardson, the nonprofit’s director and Stuart Richardson’s wife. Sandquist disagreed, citing town planning commission meetings on the density change that were open to public as well as a handful of South Maryland Creek Ranch community meetings over the last year or more. As to requests to compromise on the density, Sandquist said, the town council members can only vote on the proposal in front of them. Everist said though he has promised all along not to try to annex and develop his roughly 640-acre parcel that forms the north part of Maryland Creek Ranch, he made his pledge legally binding after FOLBR representatives and other locals expressed fears about what could happen to that land in the future. Everist signed a covenant recorded with the parcel’s deed that he would never annex the land into the town, which means any development must comply with county regulations that currently stipulate one unit per 20 acres. The landowner of the property east of Maryland Creek Ranch across Highway 9, called Eagles Nest Mountain Ranch, LLC, was party to the covenant, and the county was a beneficiary. The covenant calmed people down and resolved the annexation creep issue, Everist said. Marty Richardson called the agreement a partial win, and Stuart Richardson said it seems to be a good blocking mechanism to stop development going north. The town’s population of just over 4,000 residents is projected to grow to nearly 6,000 over the next 15 years, and Richardson said he thinks Silverthorne should stop there. Marketing studies for South Maryland Creek Ranch show roughly 50 percent of its homeowners will come from the Front Range, with the rest split nearly evenly between out-of-state buyers and relocating Summit County homeowners. The majority of units range from $550,000 to $625,000, and 26 estate plots will be available for owners to build homes as they choose with values of $1 million and up. Everist and his team held information sessions in the spring with FOLBR, the Three Peaks and Eagles Nest HOAs, Lake Dillon Fire Rescue and Colorado Parks and Wildlife to explain slight tweaks to the original proposal, including a revised wildlife impact plan and several strategies to relieve traffic congestion during construction and after build-out. One meeting drew about 50 people. Everist said construction crews will be prohibited from using a road shared by South Maryland Creek Ranch and Three Peaks, the neighboring subdivision to the south, and a camera will be installed for enforcement as well as to monitor traffic in the future in case a stop sign or other control device needs to be added. He also said some of the project’s houses were moved away from Three Peaks to address view concerns, and in the last few months, the development agreed to pay the town a $4,000 fee for every lot sale past the 83 units approved nearly 10 years ago. At its May 27 meeting, when the town council approved the development on first reading, residents still called for a compromise in the density, but almost everyone who spoke agreed that the developer made noticeable improvements, particularly in wildlife mitigation and traffic control. Everist has pointed out that not all the FOLBR petition signees were residents of the town of Silverthorne, to which Marty Richardson said the opinions of other Summit County residents and visitors should matter as well. “These are land-use decisions that I think the whole county will face in many other ways as we face population pressures,” she said. Anyone interested in the preservation and history of the Lower Blue River Valley is invited to FOLBR’s annual community gathering and ice cream social Saturday, June 20, from 2-5 p.m. at the Slate Creek Community Hall. FOLBR is in the process of restoring the 1936 WPA structure, located on Slate Creek Road about 10 miles north of Silverthorne just south of Ute Pass Road.